It's Monday!!! Yep, I'm in a good mood! I had a pretty incredible week with my guys last week that led right into a great weekend. Tony and I are working on some projects together for his work (he's an illustrator just in case some of you weren't aware). He just came off of a huge project working on the Vampire Diaries comic and he's about to start a new project. We also have things of our own that aren't licensed projects that we are working on together. So, fun stuff ahead! We got the chance to spend time together and just talk about all the things we want to do in the future. It was a GREAT week! So…I definitely feeling Marvelous in My Monday! So, this week's MMAZ for Better With Veggies was to cook someone else's recipe. 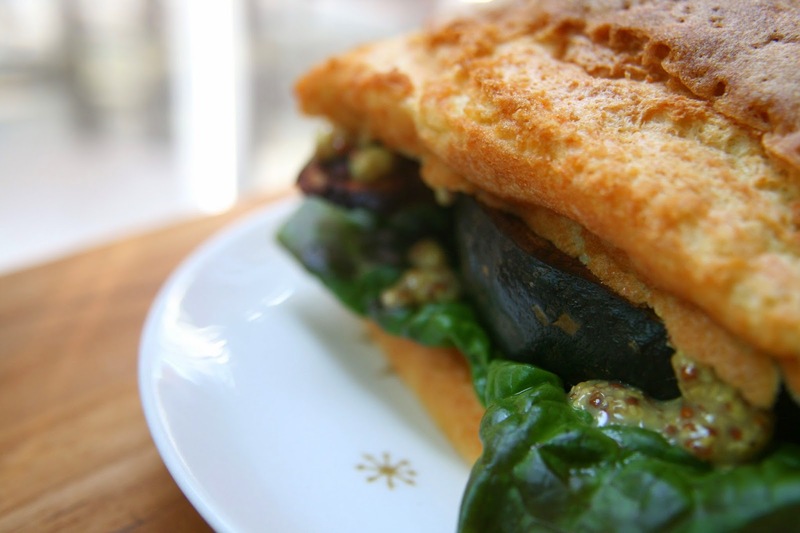 I knew right away what I wanted to make when I saw Spabettie's kabocha sandwich. Seriously, how could you go wrong? I did get a little overly excited and accidentally left the sautéed onions on the stove and didn't remember them until later. I dove right into that sandwich! OH MY GOODNESS! The combination of sweet crispy kabocha with the spicy dijon mustard, the crisp refreshing lettuce and the soft doughy bread was nothing short of amazing. 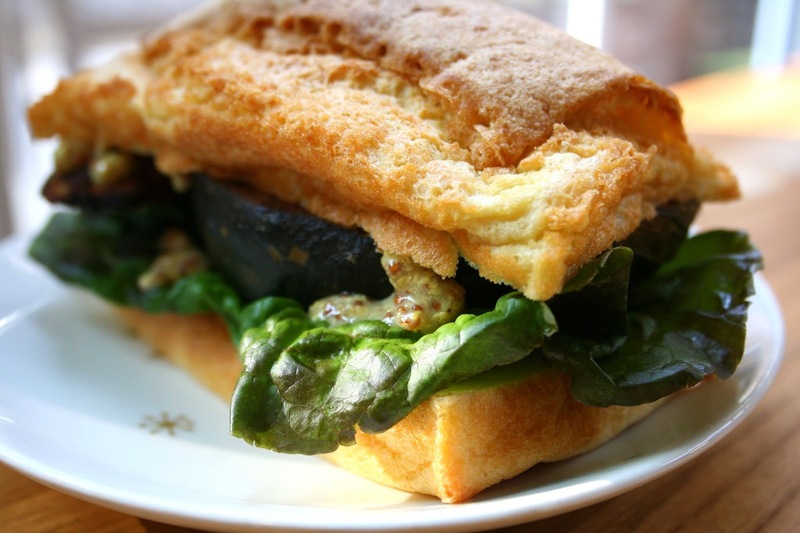 I used my protein quinoa chickpea flatbread for the sandwich to add a little protein to the mix. AMAZING! You all HAVE to make this! Combine the dry ingredients in a bowl. Add the wet ingredients and mix well. Pour batter evenly into 2 greased mini loaf pans. Bake at 450 degrees for 20-25 minutes or until lightly browned. Ok, tell me, what's your guilty addiction? Kabocha really is mine. The boys make so much fun of me for it, but I just can't get enough. I hope you all have an amazing week! I have a few recipes to share this week and a giveaway! Happy Monday! That sandwich looks pretty fantastic. I love your flatbread too. YUM. So glad you had a great weekend my friend!! so happy you liked the sandwich! and I will have to try this bread - I wonder if an eggless version would somehow work? I'm impressed how the flatbread seems almost fluffy... this may be something I have to try! Which market did you hit? I want to do H Mart next weekend! That sandwich looks amazing. I need to get more chickpea flour to do that bread. I have kabocha, obv. ok I REALLY must make this. it looks ridiculously good!!!! ALL of it - true kabocha nirvana here. This looks delicious! And I am so happy for all the exciting things happening for you two! Girl, how did I not know you had a blog??? And this is SO SO cute!! This looks like it was definitely a winner of a sandwich! 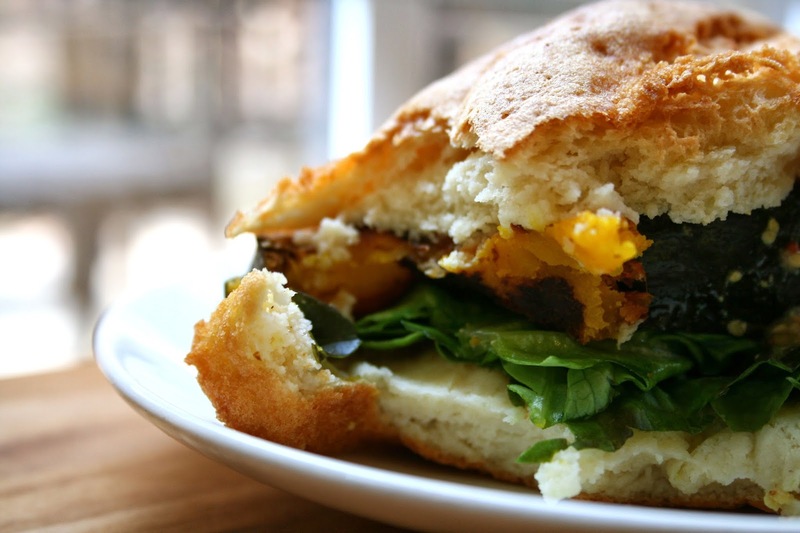 And where in ATL are you finding kabocha? I've never had it before and because of bloggers, I am DYING to try it!!! Oh wow!! Must try.. it looks amazing! So I'm pretty sure being a food writer is your niche because you made me want this sandwich...hard, and I just ate not too long ago, so I'm not even hungry. Please tell me you're coming to the Blend Retreat already. Pretty please with a locally sourced and organic cherry on top. confession... i hate cutting kabocha. that's why i don't buy it. will you move in with me and make it and i'll eat your sandwich too? LOL! Looks AMAZING! I'm making this recipe ASAP!!! Love it.